In today’s world we are in the process of recalibrating how we relate with each other. We are adjusting our relationships with smartphones, texting and social media. We are in contact with each other, both locally and globally, in whole new and unforeseen ways. Information is distributed very quickly. We are both more informed and misinformed. We are deeply engaged in life and rewiring the nature of our engagement with self and other and the city in our city life. The advent of social media does not remove our desire to create cities that serve us well, or minimize our desire for face-to-face contact. We still hunger for it. We use social media to organize ourselves – to share information, to rally, to have fun. Ultimately it is a form of connecting. As communication sparked an evolutionary burst in humans 60,000 years ago, and with the printing press more recently, we are sparking another evolutionary burst now – where do we need to put our attention to ride it out safely? 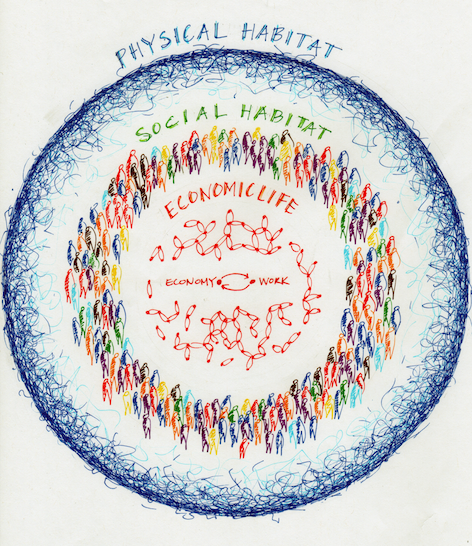 Figure 2 - City "Nestworking"
Organizing ourselves into and within cities is a process of organizing human intelligence. Looking back at Chapter 1 – The City Impulse, we can see that we are organizing our economic life in the context of our physical habitat. 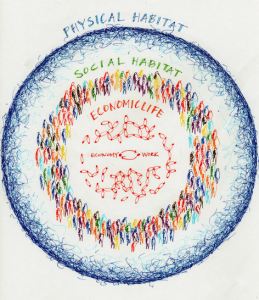 We are doing this by creating a social habitat that allows for feedback and integration (Figure 1). There is no ‘plan’, per se, but as my colleagues Don Beck and Marilyn Hamilton would say, there are patterns in the life conditions. One of the patterns is the activity of planning our cities. In Chapter 2 – The Planning Impulse, I propose that planning is one of many activities we undertake to organize ourselves. The Venn diagram in Figure 2 articulates the planning of our cities as an activity that is non-linear, messy and uncomfortable work for an uncertain future.